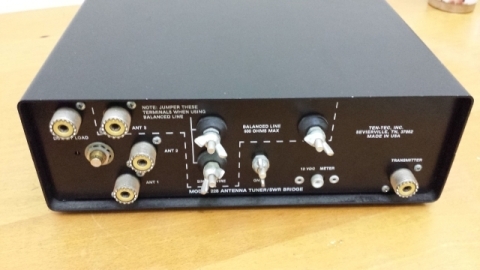 Ten-Tec 228 HF Antenna Tuner - 買賣園地 Equipment for Sale/Wanted/Trade - VR2HAM BBS - Powered by Discuz! 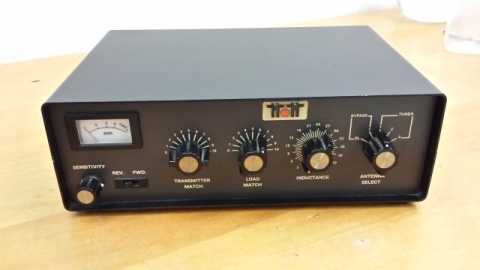 The Ten-Tec model 228 antenna tuner is an inductive/capacitive network used for matching unbalanced 50 - 75 ohm output impedances of transmitters and transceivers to a variety of loads, both balanced and unbalanced. It operates over a frequency range of 1.8 to 30 MHz. It has a built-in antenna select switch which permits bypassing the tuner or selection of three different antennas. It has a built-in SWR bridge and meter. Output= Matches most loads, balanced and unbalanced. Maximum balanced load 1.8 to 4.0 MHz is 500 ohms. GMT+8, 2019-4-25 16:09, Processed in 0.022800 second(s), 6 queries.